Here's yet another suggestion: For long strings of spaces, use 0y followed by two base-36 digits. If the number of spaces is over 36^2, use 00y followed by 3 base-36 digits; over 36^3 --> 000y followed by 4 digits; etc. For long strings of newlines, use 0z followed by a base-36 digit, and extend as needed with more leading zeroes as above. I definitely agree. Sorry if I shouldn't have posted. A for awesome wrote: I definitely agree. Sorry if I shouldn't have posted. She's apples. It wasn't intended as criticism - and I do apologize if it came across as such -, just as an observation on how different, mutually-incompatible standards can arise. As they say, perfect is the enemy of good -- and the road to hell is paved with good intentions. 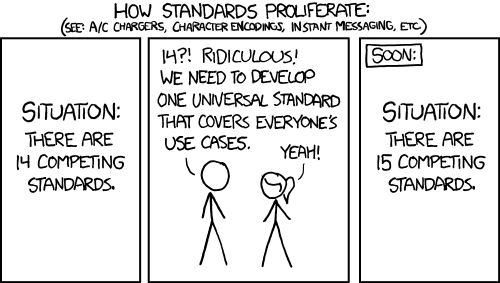 Let's not overengineer apgcodes. They're good enough for what they do, the "greedy" extension is well-accepted and has desirable properties, and for extremely large patterns apgcodes are a poor fit anyway. The resulting apgcode, without the prefix, cannot exceed 1280 bytes. I've tested the new apgcode generation on the spaghetti monster, and it agrees with the canonical form on the LifeWiki. I have yet to test multistate (e.g. Generations) patterns. Generatioms is being added too??? Calcyman, is Catagolue EVER in say, 7+ years, going to support custom rules? Saka wrote: Generatioms is being added too??? Yep, seems like Generatioms is getting added. Time to screan with joy. BTW, would this allow for multistate Larger than Life rules? How about snoitareneG rules? What about existing ov_* patterns, at least those in B3/S23? We have a couple of these -- about 22.5k ov_p46's, 20k ov_p177's, 8.8k ov_p24's, 2.6k ov_p30's, as well as about a dozen rare ov_p's and ov_s's. Provided we still know what soups all these came from, we could re-identify them and re-file them using their proper extended apgcodes. I'd be happy to help out, of course -- for both Life and other rules. 1. Including, apparently, an ov_s520 in C2_4, though looking at the soup I think that must've been a misclassification. Saka wrote: Generatioms is being added too??? Calcyman, is Catagolue EVER in say, 7+ years, going to support custom rules? It already does, inasmuch as it basically accepts anything that you choose to pass off as a rule name, symmetry type, and apgcode. If you make a search program which produces haul files for your favourite CA, then Catagolue will happily build a distributed census (as you discovered with Saka_Test). I'm surprised no-one has tried anything along these lines. The closest thing was my slow-salvo symmetry, but that was ugly in terms of implementation (indeed, I recall there was some non-deterministic element). Ideally every Catagolue-hosted search should be completely deterministic, with the 'randomness' only being present in the haul seed (as is the case for apgsearch). As well as finding new spaceships in a systematic and distributed manner, it may help inform which combinations of hyperparameters are most effective for running zfind. is apgsearch EVER in say, 7+ years, going to support custom rules? Maybe. The current progress on v4.0 has completely separated various levels of abstraction, so that you can write custom backends (as I've done for Generations, and will be doing for LtL). Any backend you write in this manner must take a 32-by-32 square of cells and return the 16-by-16 centre square after a number of generations (usually 1 for simplicity). Once you've written that, it is automatically compatible with either of two containers (apg::pattern, which runs HashLife, and apg::upattern, which is based on vlife). So, provided you can write the C++ code to run a 32-by-32 square in your rule, the rest of the lifelib boilerplate code will be able to run unbounded universes efficiently in either a conventional or hashed manner. HashLife has the advantage that for regular patterns, it will eventually memoize all of the 32-by-32 tiles and never need to call your backend code again. apgsearching one of those custom speeds/directions rules would be quite interesting. Would it be possible for replicators and quadratic growth patterns to be recognised and encoded like still lifes, oscillators and spaceships? xr for one-dimensional replicators, xt for two-dimensional replicators, and yq for quadratic growth patterns.